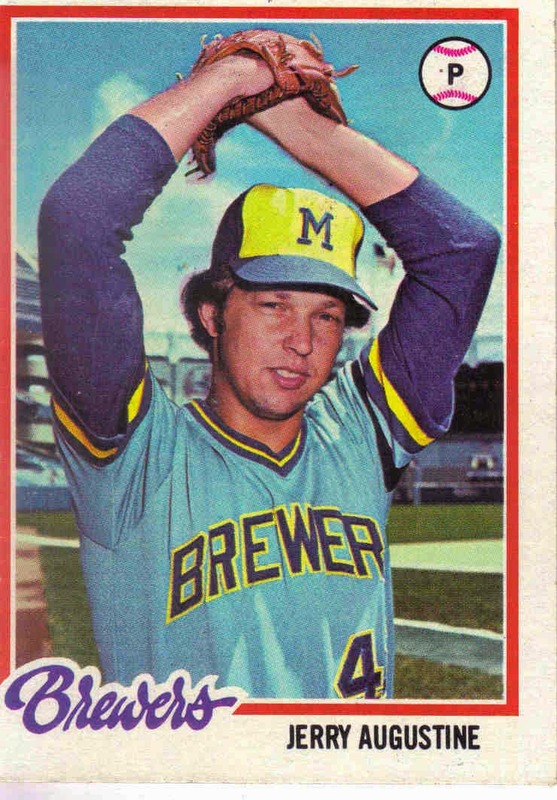 Happy Birthday to Jerry Augustine, who was a pitcher for the Brewers from 1975 to 1984. Jerry and I were in just one game together. It was May 23, 1976 at Cleveland Stadium and it was Jerry’s rookie season. It would also be my last. I was traded to the Rangers four days later, and a few weeks after that, an injury ended my playing career. I was the starting pitcher and got pulled in the fourth inning after giving up an RBI double to Gorman Thomas, cutting The Tribe’s lead to 5-4. The Tribe eventually added three more runs, enough to win 8-5. Jerry came in to pitch in the sixth inning and pitched great. He replaced Ed Sprague with two outs, John Lowenstein on second and Charlie Spikes on first. With Alan Ashby at bat, John tried to steal third and got called out on a close tag by Don Money. Jerry had 1-2-3 seventh and eighth innings.